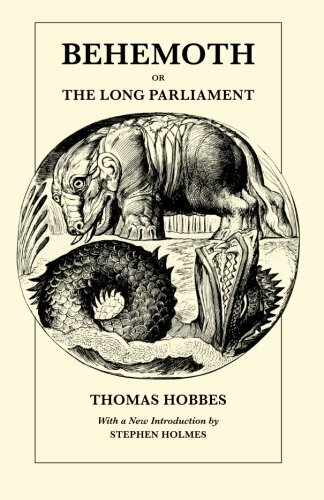 Behemoth, or The Long Parliament is essential to any reader interested in the historical context of the thought of Thomas Hobbes (1588-1679). InDe Cive (1642) and Leviathan (1651), the great political philosopher had developed an analytical framework for discussing sedition, rebellion, and the breakdown of authority.Behemoth, completed around 1668 and not published until after Hobbe's death, represents the systematic application of this framework to the English Civil War. In his insightful and substantial Introduction, Stephen Holmes examines the major themes and implications of Behemoth in Hobbes's system of thought. Holmes notes that a fresh consideration of Behemoth dispels persistent misreadings of Hobbes, including the idea that man is motivated solely by a desire for self-preservation. Behemoth, which is cast as a series of dialogues between a teacher and his pupil, locates the principal cause of the Civil War less in economic interests than in the stubborn irrationality of key actors. It also shows more vividly than any of Hobbe's other works the importance of religion in his theories of human nature and behavior. Stephen Holmes, a professor of political science and law at the University of Chicago, is the author ofBenjamin Constant and the Making of Modern Liberalism.